Young boys in a small Midwestern blue-collar suburb spend long summer days exploring the natural wonders in a small field where the town sewer spills into a tiny brook. When one day they spy a gigantic frog five times the size of the small green reptiles they’re accustomed to targeting with their BB guns, he becomes the stuff of legend – and hoped-for glory. 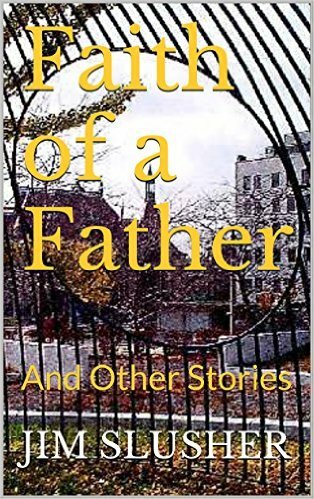 Big Sam’s story, contained here in full, is one of a diverse collection of tales in Faith of a Father and Other Stories, available in e-book on amazon.com, including a father’s life-changing confrontation with the meaning of religious faith, a heart-stopping adventure for a mayfly swarm on a country pond, an orphaned teenager’s encounter with justice and more. When I was very young, I lived in a place called Marquette Heights. It is a small town in central Illinois, and in the 1960s, it was very much what we would call a bedroom community today. Men and women bought homes there, and raised their families there, but they couldn’t do much more than that. There was no business district with grocery stores or clothing shops. There was no industry. There were not many businesses to work at. For groceries, shopping, work and even to attend church, people had to drive 15 or 20 minutes to nearby Pekin or Peoria. My family — my mom and dad, my two younger brothers and my younger sister and I — lived in a small, three-bedroom house on Hamilton Street that pretty much looked like all the other small ranch-style homes that lined the streets winding somewhat wildly through town. Just a couple blocks from us was a large empty field that served as a kind of drainage area for the community. The circular lot was mostly surrounded by streets and homes, but at one point, sort of like the valve on the tube of a tire, a large concrete pipe jutted out of the ground and emptied its contents — which is to say most of the wastewater of the town — into a small creek that formed a slight section of nature snaking through an otherwise non-descript collection of residential homes and concrete streets. The pipeline was not just an outlet for rainwater draining from the Marquette Heights streets and lawns. It was also an outlet for the pent-up energies and endless, sometimes callous, curiosities of young boys. It was the place where my friends and I escaped, when we wanted to sneak away alone and talk about things we could share with no one else, especially not our parents. The concrete pipes were so large that we could enter them easily, needing only to stoop slightly. Most of the time, a small trickle of water drained along the bottom, so we could walk deep into the thrillingly dark aqueduct without much effort. We spent hours exploring the network of veins and arteries crackling wildly underneath the town. In hot summers at a time when few people had air conditioning, we enjoyed the moist cool of the place and the cold gritty inner lining of the cement. Sometimes, we would follow the various curves and corridors for hundreds of yards in unpredictable directions, looking for the drainage grates from our own streets. Looking up to see our homes or the homes of our neighbors from underground, with the sunlight streaming behind them and the lines of the grates forming the pattern of prison bars — an interesting comparison, since we felt anything but imprisoned on these adventures. We felt excited and free. Most of the time, though, we spent at the mouth of the water pipe, sitting with our backs against one side of the pipe and our legs bridging the trickle of water streaming lazily from the pipe into a small pool about the size of a kiddie swimming pool, only two or three times as deep, with moss-covered rocks piled like weird shaped bowling balls across the bottom. We laughed. We whittled sticks with sharp pocket knives. We talked about school and girls. And we constantly explored. It was a different time, and a different place, and parents and children didn’t always have the same relationships they have today, particularly in the suburbs. In summers, our mothers, most of whom worked at home while our fathers did their various jobs at the Caterpillar factory in Peoria, would shoo us out of the house at eight or nine in the morning and not expect to see us again until lunchtime, after which we’d be gone again for the rest of the afternoon until our fathers returned home and we heard our names called from afar or responded to that unique whistle that told us it was time for dinner. As children, in short, we had plenty of time to wander and let our imaginations have their sway. And, though it was only a small patch of nature, “the sewer” as we called this little grotto was a place with enough mud and trees and rocks and bees and ants and dragonflies and salamanders to keep us occupied for days on end. And, there were frogs. You could hear their gutteral croaks all day long, especially in the early evening as the sun began to dip behind the trees and hills surrounding the sewer. It may have been the frogs that drew us the most – though I must admit not always for the most innocent of reasons. Remember, this was a different time and a different place, and the attitudes of both adults and children toward wildlife were somehow different, too. Much less gentle. Indeed, as I look back on them now, they were often simply cruel. And it was one of the cruelest acts, an act involving a frog that I’m remembering now. Most of the frogs we would see down at The Sewer were small, dark green reptiles that fit easily into your hands. In our most endearing moments, we would catch them and feel their tiny feet and round bellies against the skin of our palms. In less honorable moments, we would target them with our BB guns, and cheer if we made a hit. For reasons good and bad, the frogs were a prime attraction. We were nine, ten, eleven years old. Our parents were strict and moral at home. But we were often not at home, and they, for that matter, didn’t care much about frogs. So, they had little idea of what we did down at The Sewer as long as we returned when we heard our names or our father’s whistles. And when we told them at the dinner table, if we decided to bring them into our confidence at all, that we had shot our BB guns at frogs, their gravest concern was that we be safe in only pointing the guns at the reptiles and never at each other. Not that shooting the frogs was our primary objective. It was just something that happened, and if I told you this story without telling you that it happened, I would not be honest about what we did or the kind of boys that we were. And you probably would not fully understand why Big Sambecame so important to me, and why I remember him so fondly even now, more than 50 years later. Big Sam, to our experience, was a mysterious freak of nature. It was one of my friends who first saw him, pointing and squealing, “Look at that one! Look at that one!” to direct our attention one warm summer evening to a large yellow ball with eyes the size of marbles piercing the surface of the water almost camouflaged against the glistening wet moss of the rocks below. Others of us, we were almost always in groups of four or five, rushed to look and marveled at this seeming King Kong of the frog world. He was the size of a bag of sugar, and his legs floated out below him like green vines. “I’m gonna run home for my BB gun,” said my brother, Bruce, two years younger than me but a welcomed and respected member of our informal club. But we couldn’t. Before any of us could move to a rock close enough to have any hope of reaching out for the giant frog, he dipped his snout beneath the water and dashed into the rocks. We pulled off our socks and waded in to try to find him. We felt all around and under the slimy rocks. But it was no use. The giant was gone. We had all kinds of speculation. Perhaps he was a freak, just one of those rare beings Nature sometimes foists on the world, like Godzilla. Maybe he was a long, lost relative of the dinosaurs. Maybe, well, who knew? He was just huge, that was all we knew and all we needed to know. He became a legend. We, of course, didn’t know for sure that he was in fact a he, but we couldn’t conceive of a frog that size being a girl, so we simply assumed his maleness and christened him with an identity we thought befitting his mythical status and stature: Big Sam. Often, he would just float there in the dark water, seeming to watch us with almost as much fascination as we watched him. He became both a mystery and a mission. The boy who finally caught Big Sam would surely become a legend among us. Or so we thought. In fact, I don’t remember who it was who got him. It wasn’t Ricky or Billy. It wasn’t my brother, though both he and I were there on that hot Saturday morning. All I recall now is looking up from the far side of the pool to see a laughing, gleeful young boy in shorts and striped T-shirt standing on top of the concrete pipe. The boy was holding a large cement block over his head with both hands, his arms shaking under the weight. It was too late, but it was in time. The boy heaved the cinder block toward the pool and it exploded into the water sending up a spray of giant beads that ricocheted off my legs and splatted into the dirt beside me. The block had landed precisely where we’d seen Big Sam, staring up lazily just moments before at an attacker whose evil intent he could not have known. The giant frog, though, was nowhere to be seen. My brother and I did not speak but just waded into the pool in our shoes and picked up the cinder block the boy had thrown in, our stomachs about to wretch from what we expected to see beneath. “I thought I saw him dive under just below you threw the block,” I said. We three crawled into The Sewer pipe and sat breathing quietly for a long time. The boy tried to gloat over his near success, but my brother and I would not listen. Nearly, indeed. We agreed then that we would never try to hurt Big Sam when we saw him and we would make a pact with any of the other kids who came down to The Sewer. Big Sam was not to be touched. And he never was. At least not by us. The fact is we never saw him again. Perhaps it was trauma and fear. Maybe he sensed how close he’d come to his end and determined that this was no place to hang out. I fear sometimes that he got a glimpse of our real nature and decided we weren’t worth hanging out with after all. Whatever the situation, he survived the terrors of that awful Saturday morning. We boys went back to our whittling and our exploration of the wasps and ants and salamanders. I suppose that some still brought their BB guns down to The Sewer for target practice, but I don’t recall anyone killing frogs of any size after the experience with Big Sam. We grew up and moved on, but I think we did learn how rare legends are, and how important it is to keep them alive.